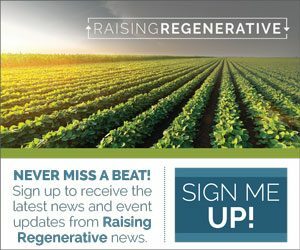 The warm southern California sun was absent for the first few days of the 2019 Natural Products West Expo in Anaheim but that didn’t prevent a bright light from shining on the work being done in the rising category of regenerative agriculture. Natural Products West, or Expo West as it is commonly called, is the world’s largest gathering for the natural, organic, and health products industry. This year, the annual event hosted 90,000 attendees and more than 3,500 exhibiting companies and featured all-day mini conferences, learning sessions, receptions, pitch contests, and an enormous expo full of start-up and veteran companies showing off natural and organic products for food and lifestyle. RFSI Forum was on-site to engage with food companies, entrepreneurs, investors, and the occasional farmer as they dove into the growing role of regenerative agriculture in our food system. So what does the discussion around regenerative agriculture look like at the world’s largest natural products event? Fairly robust and encouraging is the short answer. While not an official theme of the event, the buzz around regenerative agriculture resonated – from a day devoted to climate change, to farmer-focused sessions, to informal meet-ups for those working in regenerative agriculture, to the many food companies on the expo floor talking about how they work with and support regenerative farmers. The consistent message that food companies heard throughout the programming is that consumers are changing, creating higher expectations for the products they consume. Regenerative agricultural practices address climate change by restoring critical micronutrients to the soil, allowing it to sequester atmospheric carbon. Consumers are increasingly making the connection between this and the food and products that they eat and buy. Indeed, according to HowGood’s EVP of Research, Ethan Soloviev, 59% of Millennials and 48% of Generation X-ers surveyed are willing to pay more for food grown with regenerative agricultural practices. Food companies, too, are making the connection between regenerative agriculture, climate change, and their role in this cycle, with many across the industry taking steps toward a more regenerative food system in the last year. At Expo West’s Climate Day, company after company in the crowded room stood up to take a pledge to address climate in their own operations through new commitments to compostable packaging, grass-based livestock, a reduction in food waste, a global supply chain audit, and much more. But it wasn’t just promises made in that room. Companies are stepping up to the task of addressing the degradation of the current food system paradigm within their own operations. General Mills used the Expo as an opportunity to make the announcement that they are committed to using regenerative agricultural practices on 1 million acres of farmland by 2030. General Mills and Applegate Farms, both of whom had a large presence on the expo floor, have made recent news for programs that support farmers working toward regenerative and organic practices and for committing to products that are sourced with regeneratively produced crops and pastured livestock. While mitigating climate change presents a compelling reason in and of itself for some companies, others may find motivation in the great growth opportunity that incorporating regenerative agriculture into one’s supply chain offers. Soloviev explained that regeneratively grown product sales are increasing at a much faster rate than others. HowGood’s research shows that from 2014-18 total sales growth for the most regenerative food products was significantly higher (79%) as compared to growth in overall food sales (5%). This trend was replicated for several categories within food including dairy, frozen foods, produce, and grocery. While this growth is promising, for now food products that can be called regenerative are still only a very small fraction of the overall food produced. 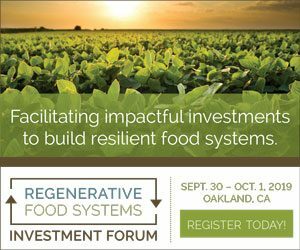 The opportunity that exists is for an increasing number of food companies to capitalize on clear consumer demand for regenerative practices, expand the proportion of regeneratively produced food in the massive food system, and ultimately grow positive returns for companies while increasing the positive impact that the food system can have on climate change.